The Talking Box: Random Question: Who's Your Favorite Sesame Street Muppet? Random Question: Who's Your Favorite Sesame Street Muppet? This morning I had my photo taken with none other than Elmo. The real Elmo, puppeteered by Kevin Clash. Immediately following, I sat in on a panel where critics asked Clash an assortment of questions, causing me to deepen my appreciation for him and his work. 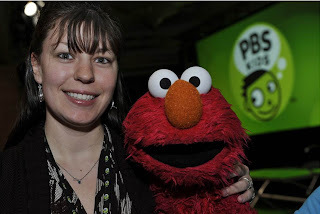 Last night I saw the PBS documentary Being Elmo: A Puppeteer's Journey, which brought me to tears three or four times. It was a heart-warming story and included some great archival footage of the late Jim Henson, among others. I'm older than many of the folks who love Elmo, and younger than many of the parents whose children were/are Elmo fanatics. This puts me in a special position. Although I grew up as big a Sesame Street fan as the next kid (and maybe quite a bit more, let's not lie...), Elmo wasn't a big Muppet for me. I was more of a Cookie Monster and Snuffy kind of kid, though Big Bird thoroughly fascinated me until I was old enough to understand how full-body puppets worked. I had a surprising number of Grover-themed items, but I personally attribute that to the fact that I was a youngster in the 80s, when SuperGrover was young and cool and had a few of those books that you followed along to the sound of Grover on cassette tape. A couple of years ago I went to the Popular Culture Association Conference, where I was thrilled to win a Bert & Ernie shirt in a raffle, and witnessed for the first time a live muppeteering, with Fran Brill performing Prairie Dawn and Zoe. I was giddy at the time, so you might imagine my excitement when Elmo talked directly to me this morning, using my name, and putting his arm around me. Tell me about who your favorite Muppet from Sesame Street is! I've always been a fan of the two-headed purple monster. They're hilarious but seen much anymore. The Honkers also make me laugh.